I got two rejections last week. 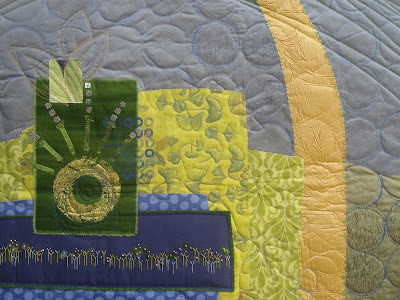 I entered this piece in the World of Beauty show at the International Quilt Festival in Houston. 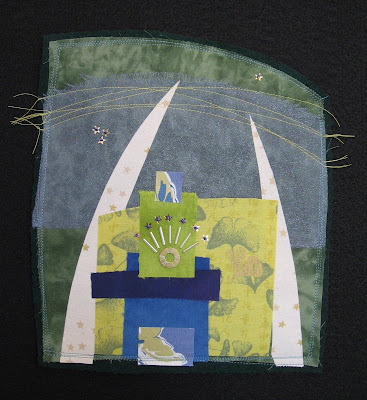 It was based on this piece that I created as part of my Lent series. See the resemblance? By the way, the smaller version is currently in the VAST 125 Mile show. We had a blast at the opening last week. Here is the piece hanging... and Benjamin peeking. I am pleased with Refuge Radiant. It was a really enjoyable and enlightening process to go from small to large. I'll enter it in some other shows, I suppose. I really enjoy going to the Houston show, and I'm just not sure it's going to happen this year. Especially, since I won't have any art on display. 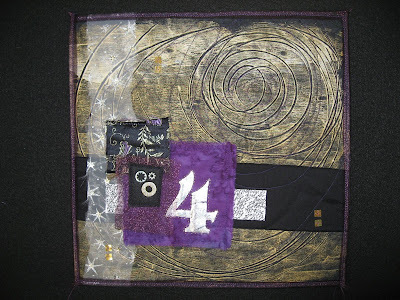 You can enter two pieces in the Houston show, so I also entered The Fourth Day from the 12x12 Art Quilt Collaborative. I still love this piece. 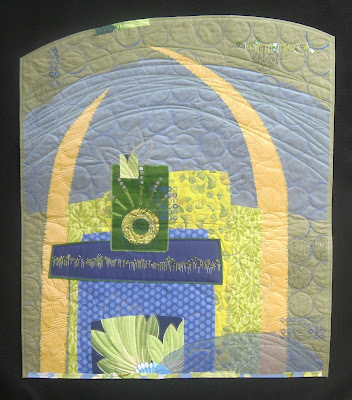 It was thrilling to have it published in Quilting Arts for my Illuminated Art Quilts article. 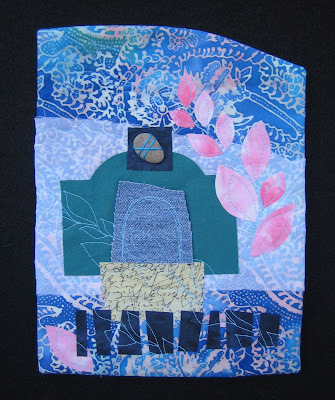 My art friends insisted I enter some of my Lent pieces... even though they are small, they represent a development of style and a simplicity of form. One of my friends even suggested I enter all forty small pieces as one entry. Maybe I should have. That could make an impact. And also Radiant, the smaller piece from above. But, I am wishing I had spent my time differently. I really want to put my Lent pieces together into a self-published book with meditations and thoughts on creating art. That project was put aside to work on entering these shows. Also, I much prefer to make small art. So why did I work so hard on Refuge Radiant? And why is the other large piece folded up in the closet unfinished? I have come to a conclusion that to enter the big shows you must make huge work that screams from across a room. You don't do that. Neither do I. Your work is so lovely and personal that I would almost hate to see it thrust into that kind of scene. I know what you mean about wishing you had spent your time differently. I think it is a tug of war a lot of us deal with. Validation is so important, but I guess we need to understand the value of different kinds of validation. Your book idea for your Lent pieces sounds perfect. I love what Terry said. I have given up entering Houston, in particular. 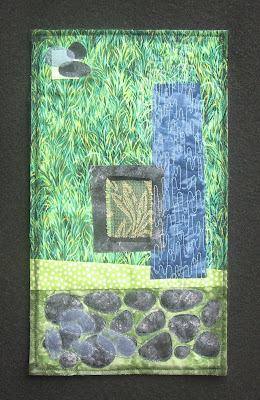 I think you will find more success in the smaller art quilt venues. I have had the series of rejections in my past, but I just keep going because, like you, I love doing it. That is what keeps me going. In fact, I can't believe how many shows I have missed entering this year, so it is not the driving force for me. I think a book of your lenten pieces would be great. I would promote it for our church library if you do. You know the old saying, "You don't know until you try," well that's why you spent your time the way you did. It's all a learning process through which you refine what it is that works for you and makes you happy. Wow, that actually sounds like I've got it figured out -- which I totally don't. I'm still in the "throw a bunch of stuff at the wall to see what sticks" phase. Lots and lots of rejections, but a few acceptances and hopefully slowly a direction will emerge. I think your small pieces have a simple energy to them and it's just a matter of time until they find their place in the world. A self-published book sounds lovely. I hope you will find time to do a book on the Lenten pieces. I've enjoyed seeing them on your blog and what you've shared about the process. Thank you for sharing your rejections with us. It makes me feel better about my rejections to know that even professional artists with talent like yours still get rejections. (I hope that sounds the way I mean it). I would love to see you publish a book on your Lent pieces. That whole project was such an inspiration to me! I would like to do something like that this next year.